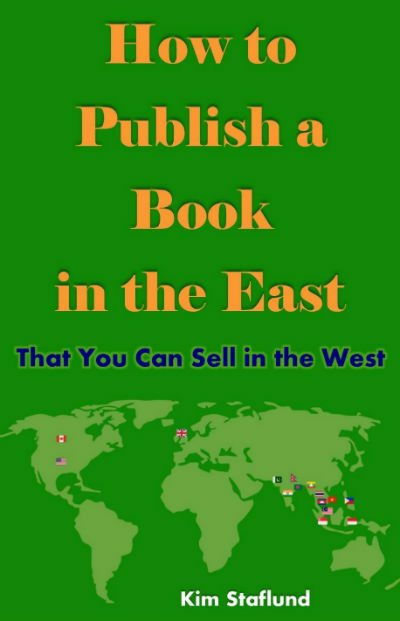 Recently we came across a book named How to Publish a Book in the East That You Can Sell in the West by Kim Staflund. However, the author has approached us with the information about the book and informed about a book promotion running on, (we’ve downloaded the book for free from Amazon then), the review is unbiased, as always. Fortunately, from our team, I got a chance to read the book. The first intriguing question you may have is, why the book title uses the words East and West? And has it any significance with the book content or is it only for the marketing purpose? Well, I also had many such questions and I will share my findings in the rest of this article. Usually our book review articles have two segments dedicated to (1)The plot and (2)Reviews. This book is not a story book, so, both these segments would be found merged in this article. We might have read/heard it for a number of times that one should not judge a book by its cover. However, no matter how true this saying is, there are many occasions when our book purchase/read decision is influenced by its cover. An attractive cover reflects the beauty and we love beauty, it is as simple as that. However, if the book doesn’t have the substance than even the most beautiful cover cannot save it. The cover page of this book is not very attractive. It reflects the book theme and tile quite correctly though. The green color also doesn’t go very well. The cover page could have been better. This is possibly the best era we are fortunate to live in. The technological advancements made the communication and traveling across the globe quite easy and affordable (compared to what and how it before a couple of centuries). And, it gave a new word “outsourcing”. Narayan Murty, the founder of Infosys, once said that (not literally) outsourcing is getting the best resources at the affordable rate to deliver something significant. Kim, the author of this book, came with a similar concept but the content here is different. The book explores the “book printing, promoting and selling” in east-west; but I recommend you to read it from the perspective of globalization. For any “how to” books, they usually provide guidelines backed with statistics and user-experiences. But, they can be fruitful only if the real message hidden within it, is explored with understanding. Sometimes, a word or phrase has different meanings in the different part of the world. However, emotions have a universal language. So, if you understood the concept, the things will be easier for you. Scouts (also sometimes referred to as talent spotters or foreign rights agents) that represent other countries such as France, Germany, Italy and other parts of the world, routinely visit London and New York in search of saleable books they can purchase subsidiary rights for, enabling them to translate and publish those books in their own languages and countries. You can find Leo Tolstoy, Jules Verne, Agatha Christie and many other authors’ work translated into many languages around the world. So the concept is there since long. But, the modern technology has made many things quite easy and approachable. And, in that regards, we must include the rise of EBooks. The author advocates EBook and its features. He mentioned in the book that he has already published a book titled “Your Ebook is an Asset… if you Own the Copyright”!!! All that said, an attractive cover is useless if your prospective customers can’t find it. That’s where keywords and categories come into play. Those who are looking for promoting children’s books found picture books as a good option. Modern-day word processors and image editors make it easy to create a picture book. There are so many readymade templates available for you make the task even easier. An author, cannot rely only on one platform no matter how fantastic it is performing. Publishing on multiple platforms gives you more reach among the readers. There are many for who ASIN, ISBN and other such terms are like jargons. They can find some of their questions get answered in this book. The book also explores the concept of Ghost writing! The example of a police officer writing a report to file is very interesting and taken from the real life. The book has some pieces of advice for those who want to become a writer (and those who are “published ones”, can also take one or two things from it). The author’s style of writing the stuff along with examples works pretty much in favor of the book. For example, there is one segment named “Why I still prefer Microsoft Word to other writing programs (Eg. Scrivener)”. You can see the topic and its summary both are mentioned in the title very effectively. The terms like “Copy Editing”, “Stylistic Editing”, “print on demand” are explained in a simple and understandable manner. I am delighted to see a discussion about “audiobooks” here. Though they are not very popular in India so far, there are countries where it really popular. There are libraries from where even the audiobooks can be borrowed. One advise I consider that should be there in the book is: “the person who is lending his voice as a narrator or character, must understand the context of the book and the way of living where the characters belong”. It can be a disaster otherwise. The discussions about EMail Marketing and Affiliate Marketing are interesting to read. However, I feel that they could have been more detailed. The book is small, however, it is not for the light reading. It is only for the serious readers and specifically for those who are associated with book writing, publishing, and marketing business in any way. So, the target audience of the book is quite limited. The book was available for Free (Kindle EBook) during its promotional days. Its print edition is not available natively in all the major countries of the world (the price of the paperback copy thus is very high. ), that is also a limitation. The author should think about decreasing the price of the book and making it more detailed to make it better. A book which is written for a group of target readers. If you associated with book publishing/writing/marketing business in any way, you will find it interesting and yet you will find that you know many things mentioned in the book. For the target readers it is around 7 stars out of 10.